See the current temperature and heating in the zone. Change the mode of the zone by clicking on the mode selector button on the at the top right of the page (under the menu). See the weekly schedule / current settings for the zone. Access the zone sub-menu for more features and settings. 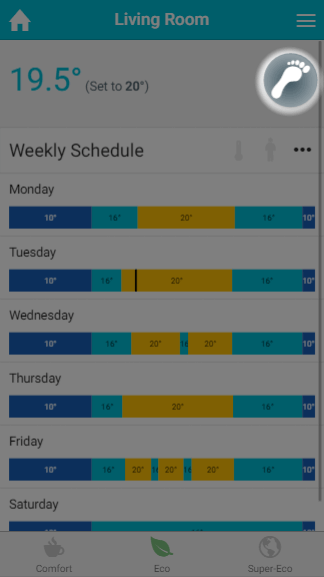 The measured temperature: This is the current temperature in the zone, and is displayed if the zone has a device which feeds the temperature back to the app (such as a Room Sensor or Thermostat). The colour of the measured temperature is an indicator as to whether the zone is calling for heat. If the temperature is blue, the zone is up to temperature and not calling for heat. When the measured temperature is orange, the zone is trying to heat up and so calling for heat (or on if it is an On/Off room). The set temperature: The temperature the zone is currently controlling to. For an On/Off zone, this will display whether the zone is currently on or off. The mode selector allows you to easily change the mode of a zone. The current mode icon is always displayed in the mode selector. To change mode, click on the mode selector and the other available modes will be displayed. Click on the mode you wish to change the zone to and the page will update. If you wish to stay in the current mode, just select the smallest icon on the right hand side of the mode and the mode selector will close. To find out more about each of the modes available, see the relevant chapter. The pre-heat symbol: This symbol will light up when the room is heating due to the pre-heat settings, and greyed out otherwise. For more information on pre-heat, please see the 'Setup Pages' chapter. The occupancy symbol: This symbol will change when occupancy is detected, and changes in different ways depending on the mode of the zone. In Footprint Mode the occupancy symbol can be tapped to get more information on how much occupancy has been detected, and when the heating will turn on/off. Off mode: For radiator zones, this puts the system into frost protect whereby the heating will only turn on for that zone if the measured temperature drops below the temperature displayed in the on-screen message. For On/Off and TPI Zones, this will turn the zones off and they will no longer call for heat under any circumstances. Timer mode: The heating in the zone will follow a chosen schedule, as shown in the timer bars. 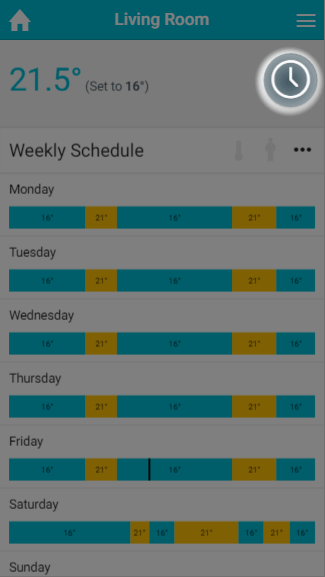 You can change this schedule to suit your circumstances on a zone-by-zone and day-by-day basis. 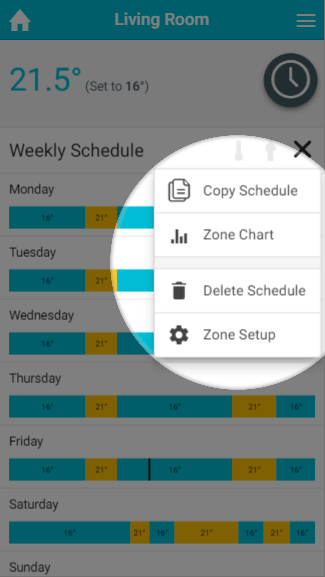 The settings you can choose from differ based on the type of zone you are viewing. 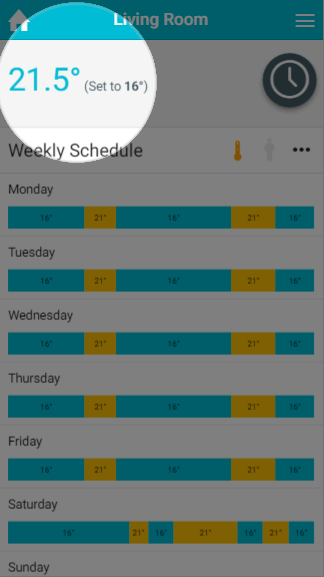 To change the schedule for any day, click on the timer bar for the day you want to adjust. Footprint mode: In this mode the system will heat the zone based on whether the zone is normally used at this time, and if there is anyone currently using the zone. 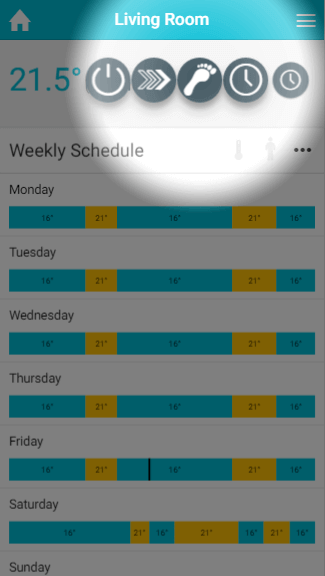 The timer bars are not clickable in this mode as the schedule is automatically created by your Genius Hub. 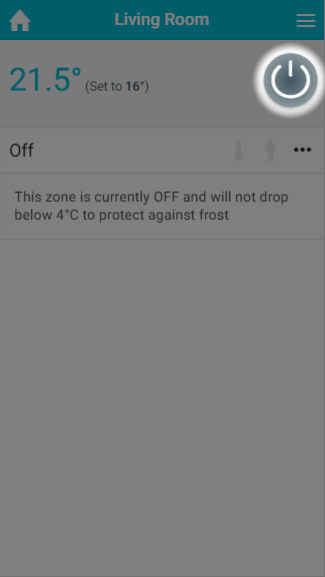 Override mode: This mode allows you to temporarily adjust the heating in the zone, by setting an override of a set temperature and duration. 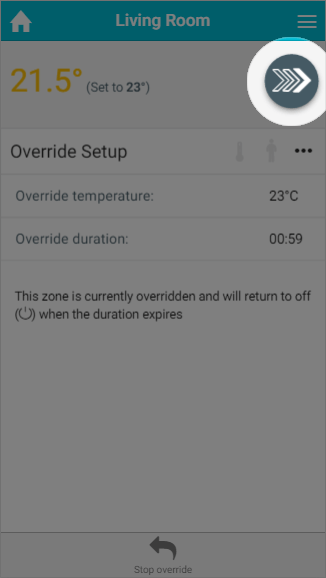 For On/Off zones, override switches the zone on for the duration set. On the right hand side of the Current schedule / settings title bar is the zone sub-menu. The sub-menu provides options to access other pages related to the one you are currently viewing, perform quick actions or change the setup of the zone you are viewing. More options may be displayed depending on the mode is active for the viewed zone. These will be described in the chapter for the relevant mode. The chart pages display the historical heating and occupancy data for the zone you are viewing. For more information, please see the 'Charts' chapter. Setup pages allow you to change the configuration of a zone, such as its name, what devices are assigned to it and enable extra features such as pre-heating. For more information, please see the 'Setup pages' chapter.